Lucy hears noises in the walls of her house, and she just knows there are wolves living inside, watching them, waiting to come out. But no one believes her - it is apparently too terrifying to even contemplate, because, as her father says, "When the wolves come out of the walls, it is all over." So it must be bats, or mice - anything but wolves. But then the wolves come out one night and take over the house, leaving Lucy and her family to sleep out in the garden. Worst of all, Lucy has left her beloved pig puppet behind. Her family is befuddled, anxious, directionless - but Lucy, with the gumption of a true heroine, takes matters into her hands, determined to reclaim her house - and, more importantly, her dear pig puppet. This is a very unusual book – the illustrations are a collage that mixes drawing, painting and photographs. The characters have faces that are eerie and often expressionless, with empty black dots for eyes. 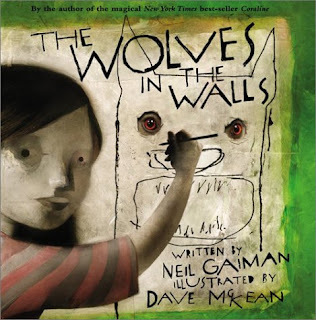 And the storyline itself is creepy – the thought of wolves living in the walls is stuff of nightmares, but at the same time the story has an edge of silliness and absurdity – especially at the end. The wolves are funny and creepy at the same time, too – they are drawn with bold black strokes and frightening features, but are depicted doing silly things, like snoring sleeping upside down on the bed wearing Lucy’s socks. 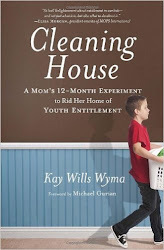 I love this book, and my children do, too -- but I can see that it is not the sort of book that everyone would enjoy. 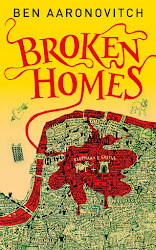 It is eerie and unsettling, but funny and exciting, too – I particularly like that Lucy is a strong, brave character who solves her own problems. I would recommend this book to older children – definitely not preschoolers! – with a taste for scary stories. This would also be a good choice for readers who enjoy graphic novels. We really do have similar taste :D I love this book! I agree about it being unsettling, though - definitely for older children. Great review! You've probably seen it, nymeth, but I'll also take this opportunity to recommend the film MirrorMask to anyone who likes this book. It has the same fun, quirky but creepy feel, and Gaiman and McKean were both involved in the making of the movie. i was just about to suggest mirrormask, as well! i love that movie! ... except for the soundtrack - bad jazz for some reason - it's excellent. I have absolutely no recollection of the music! I guess that's not a ringing endorsement of it, either.